Material Other The new aluminium multi-roller trailers are suitable for fibreglass boats and are also fitted with stylish alloy rims and bearing protectors, matching moulded mudguards with a convenient step for on- trailer access to the boat, disc brakes and easy-to-use Hydrastar braking systems, super heavy-duty alloy wind-up and swing-up jockey wheels are fitted as standard from 6.6m, with tube adjustments available to match individual vehicles. Every steel component – axles, springs, u-bolts, bolts and nuts – used on the trailers has also been hot-dip galvanised or Dacroment coated for ultimate durability in Australia’s harsh marine environment. 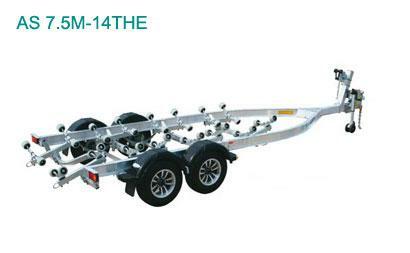 Please contact us regarding the most suitable trailer for your vessel.